Our carts come with a Lifetime Warranty! Our recycling carts are the most durable recycling carts available on the market; designed and built specifically for Florida's harsh weather. No paint to peel, no metal to rust! 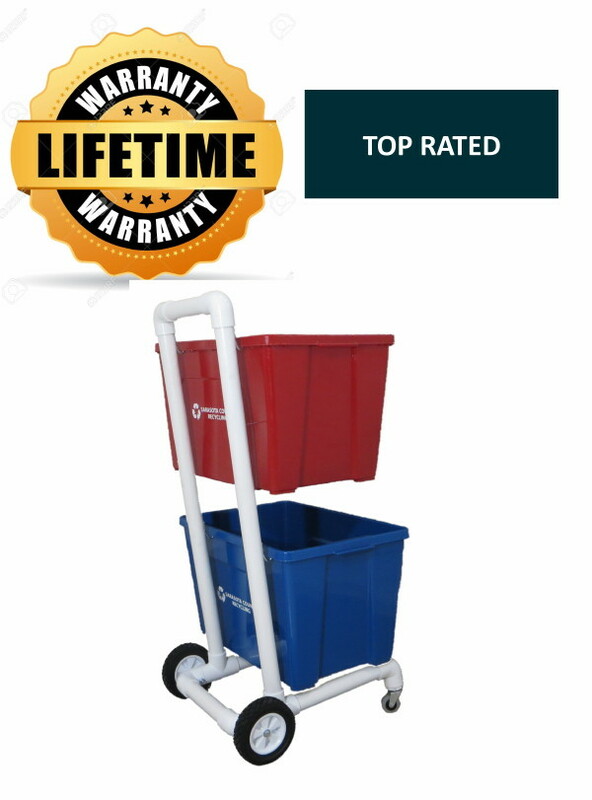 Our carts feature a Lifetime Warranty, 2 wheel and 4 wheel models, heavy duty commercial grade wheels, free delivery to your door, made of either heavy duty 2" or 1-1/2" PVC which will not rust. No more heavy lifting! Use one of our recycling carts to easily roll your bins to and from the curb. Keep your garage neat and tidy. Also makes a great gift! Why Buy a Recycling Cart From Us? We only build high quality carts made to last a lifetime! Our carts come with either 2 or 4 wheels for easy maneuvering. Our 1-1/2" and 2" recycling carts come with a Lifetime Warranty. No other cart manufacturer offers a lifetime warranty. We only use commercial grade lawnmower wheels on our carts. Other cart manufacturers use cheap hollow or spoked wheels. Our carts are designed to last a lifetime. Other carts rust and fall apart in a year or two. We offer 4 wheel models that are easy to maneuver and easy to move away from the wall. Our carts are rated #1 with the National Recycling Foundation. Our recycling carts are made of strong 2" or 1-1/2" PVC designed for Florida weather. Other cart manufacturers use cheap steel that rusts over time. Our carts are simple to assemble and require no tools! Other manufacturer carts use a lot of parts, require tools and take a considerable amount of time to put together. Our recycling carts are Made in the USA! Other manufacturers have their carts manufactured overseas and use cheap materials and parts. Our carts will keep your garage neat and tidy. Our recycling carts make recycling a breeze. Easily and effortlessly move your bins from the garage to the curb! 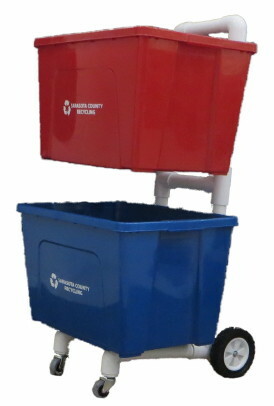 Our quality recycling carts are so durable we offer a Lifetime Warranty on our 1-1/2" and 2" models. Our PREMIUM Recycling Cart has 4 wheels for easy maneuvering. On garbage day you can easily roll your bins to the curb and roll them back to the garage. 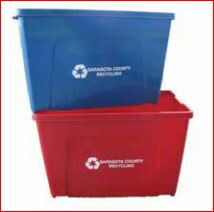 Our recycling carts will keep your garage neat and tidy - no more recycling bins on the floor. Our carts are lightweight, won't rust (like the metal models) and include heavy duty wheels for easy rolling. Heavy Duty 4 Wheel Model 1-1/2" PVC - Lifetime Warranty! Heavy duty premium recycling cart with 4 wheels for stability, holds any standard recycling bin. Our premium recycling cart is considered one of the best recycling carts manufactured in the industry. Made of heavy duty 1-1/2" PVC and is so durable that we offer a LIFETIME WARRANTY! This space saving design is only as wide as the bins. The Premium recycling cart includes top of the line commercial grade lawnmower wheels in the back and commercial grade caster wheels in the front for smooth and easy rolling. The wheels are mounted with all stainless steel hardware. Very simple to assemble (assembly time is approximately 30 seconds and no tools are required!). For dimensions and additional photo's click here! Clips are made of heavy gauge stainless steel and holds up to 400 lbs! Rated the #1 Recycling Cart in the industry! Heavy Duty 2 Wheel Model 1-1/2" PVC - Lifetime Warranty! 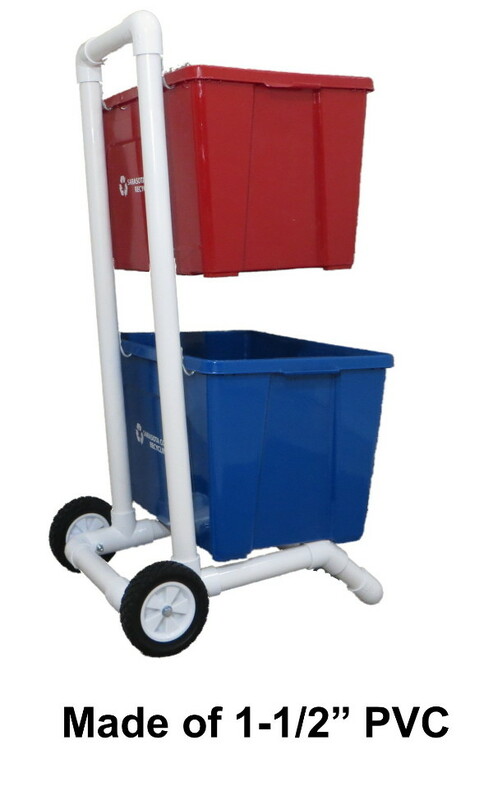 Heavy duty premium recycling cart, holds any standard recycling bin. Our premium recycling cart is considered one of the best recycling carts manufactured in the industry. Made of heavy duty 1-1/2" PVC and is so durable that we offer a LIFETIME WARRANTY! This space saving design is only as wide as the bins. The Premium recycling cart includes top of the line commercial grade lawnmower wheels for smooth and easy rolling. The wheels are mounted with all stainless steel hardware. Very simple to assemble (assembly time is approximately 30 seconds and no tools are required!). For dimensions and additional photo's click here! 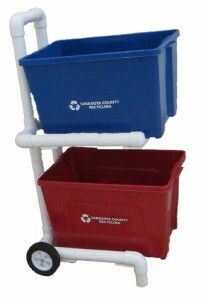 Recycling Cart Heavy Duty 2" PVC with 2 Wheels & Shelves - LIFETIME WARRANTY - FREE SHIPPING/DELIVERY! Our narrow recycling cart is an excellent choice for those who have 2 cars in the garage, or a have a 1 car garage with limited space. Our narrow model is easy to navigate between 2 cars or tight areas. Recycling bins are loaded from back to front, handles first. Click here for dimensions. 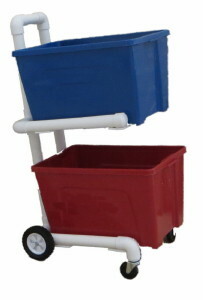 Recycling Cart Heavy Duty 2" PVC with 4 Wheels & Shelves - LIFETIME WARRANTY - FREE SHIPPING/DELIVERY! Our narrow recycling cart with 4 wheels is very easy to maneuver. No need to tilt the cart back. Includes 2 wide back wheels and 2 caster wheels in the front. Recycling bins are loaded from back to front, handles first. Click here for dimensions.